Again less than a year since the publication of the last fascicule of the DMLBS, we are pleased to announce the publication of our next fascicule, number XVI. This fascicule, containing 224 pages of dictionary text, begins at solvere and ends at syricum. 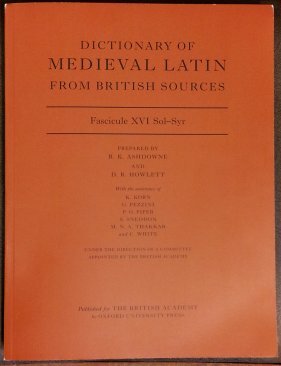 Our advance copy of the new fascicule arrived at the DMLBS office today, and copies will be available shortly for purchase through the usual channels. Drafting, revision, and checking work continues on the next fascicule, which we expect to publish at the end of the year. This is expected to cover the rest of the alphabet. Information about the fascicules of the dictionary that have already been published can be found in the Publications section of our website. Squeee! Must place order for that, and all the ones that I’ve missed over the last 2 years or so, ASAP!